Sports and Recreation Programs are designed to teach foundational principles in sports and guide youth to develop cooperative teamwork and sportsmanship values. Combined with the Youth Fitness Orientation Program youth will learn to develop and maintain healthy lifestyles in these clinics. Some programs are only available by season. All programs are subject to cancellation or changes due to low enrollment. Programs are 8-10 weeks in duration unless otherwise noted. These are great opportunities to bring new energy to your school or organization during a time when staying indoors is your only option. 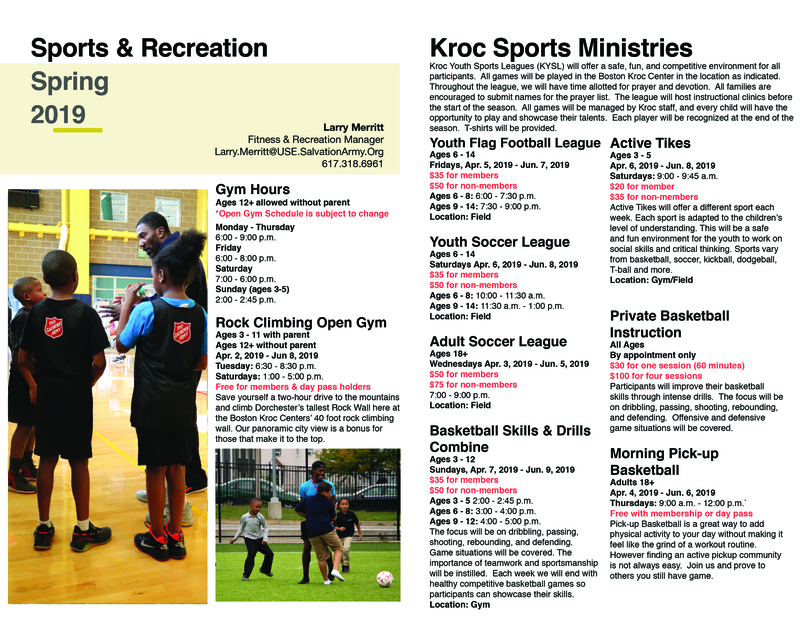 Kroc Youth Sports Leagues (KYSL) will offer a safe, fun, and competitive environment for all participants. All games will be played in the Boston Kroc Center in the location as indicated below. Throughout the league, we will have time allotted for prayer and devotion. All families are encouraged to submit names for the prayer list. The league will host instructional clinics before the start of the season. All games will be managed by Kroc staff, and every child will have the opportunity to play and showcase their talents. Each player will be recognized at the end of the season. T-shirts will be provided. BASKETBALL SKILLS AND DRILLS COMBINE Co-ed I Ages 3-12 I $35 for members / $50 for non-members. Participants will improve their basketball skills through intense drills. The focus will be on dribbling, passing, shooting, rebounding, and defending. Offensive and defensive game situations will be covered. The importance of teamwork and sportsmanship will be instilled. Each week will end with healthy competitive basketball games so that participants can showcase their skills. PRIVATE BASKETBALL INSTRUCTION Co-ed I Ages 3-12 I $30 for one session / $100 for 4 sessions. Active Tikes will offer a different sport each week! As a member of The Salvation Army Boston Kroc Center, you will receive a complemetary 20 minute fitness consultation. ADULT SOCCER LEAGUE Co-ed I Ages 18+ I $50 for members / $75 for non-members. Rock climbing is great exercise and a fun way to build community. 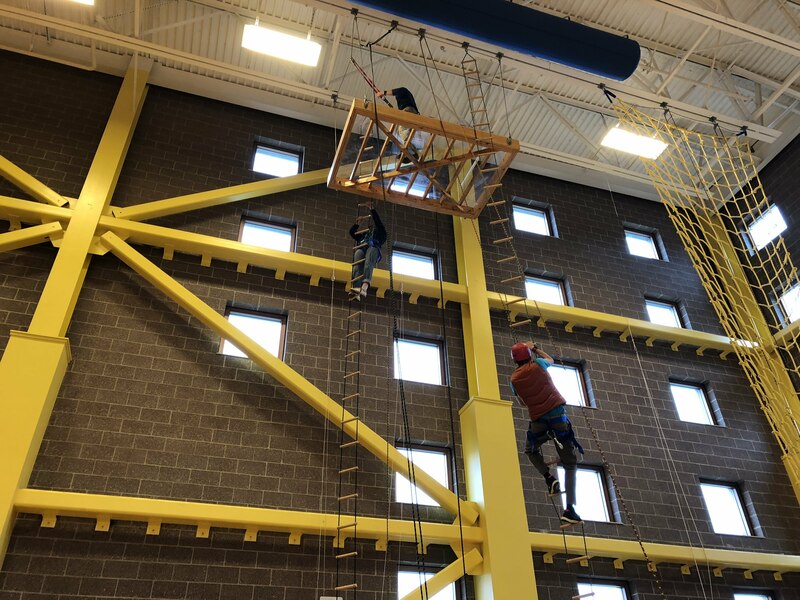 Come reach new heights with fellow members. For questions about Sports And Recreation please contact Larry Merritt at 617.318.69 or email larry.merritt@use.salvationArmy.org.